We’d love your help. Let us know what’s wrong with this preview of The Fortunes Of Richard Mahoney by Henry Handel Richardson. Set in Australia during the gold-mining boom, this remarkable trilogy is one of the classics of Australian literature. Henry Handel Richardson’s great literary achievement, comprising the novels Australia Felix, The Way Home and Ultima Thule, weaves together many themes. Richard Mahony, despite finding initial contentment with his wife Mary, becomes increasingly dissatified Set in Australia during the gold-mining boom, this remarkable trilogy is one of the classics of Australian literature. To ask other readers questions about The Fortunes Of Richard Mahoney, please sign up. I don't think I have ever cried so hard and so long as when I arrived at the end of this book. I read it at a time when I had the time and inclination to embrace and be embraced by a genuine epic. I don't know whether I would be as patient now, but that is my loss. Hopefully, you, with the time available to you, will be more patient than me and you will be rewarded more recently as well. Some things in life, as Paul Keating once said of his political opponent, should be done slowly. This book and great literature in general are good examples. When your country has a tiny population, like Australia's, authors often have to symbolize more than one thing. Richardson, for instance, is Australia's Joyce (insofar as she wrote one of the great Australian young person comes of age novel). She is Australia's Eliot; not only did she, like George, give herself a 'man's' name; she also knew far more about 19th century intellectual life than most people of her circle would have known, and put that to good work in her novel Warning: plot spoilers. When your country has a tiny population, like Australia's, authors often have to symbolize more than one thing. Richardson, for instance, is Australia's Joyce (insofar as she wrote one of the great Australian young person comes of age novel). She is Australia's Eliot; not only did she, like George, give herself a 'man's' name; she also knew far more about 19th century intellectual life than most people of her circle would have known, and put that to good work in her novels. She is Australia's Melville, having written a quasi-symbolic novel about her young nation's growth and, more importantly, its flaws. And she's Australia's Mann, having written the country's great realist novel, and one of its great modernist novels. 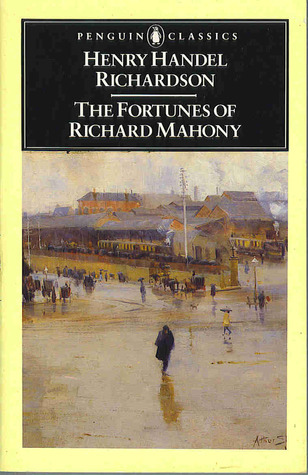 But Richardson managed to make them two parts of one massive book, The Fortunes of Richard Mahony. 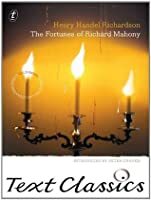 Sadly, Richardson's major novel is not as great as that by those men and women, but 'Richard Mahony' is, I'm fairly sure, unique in world literature. The first volume, 'Australia Felix,' starts out with an astonishing 'proem,' an almost grotesque visual sequence in which men are "ensorcelled--without witchcraft" by the "unholy hunger" for gold. But this is better read as the proem to the novel as a whole. 'Australia Felix' is a standard, enjoyable realist tale of a young migrant, who wins a wife, makes some money, and decides to return home. In volume two, 'The Way Home,' our hero fails in the old world, returns home, and becomes massively wealthy. In 'Ultima Thule', his wealth gone, he slowly goes insane. If it were only this, the book would be fairly forgettable. But it is also to some degree a portrait of the nation's soul (though Richardson might have been uncomfortable with this reading): deeply ambivalent about its relationship to the old world, with fears of inferiority ('culture cringe'), ambitious but disgusted by ambition, greedy but egalitarian, and so on. More importantly, Richardson begins the book in a fairly bland, realistic style, but as Mahony becomes more and more unstable, the strong third person narrator loses its grip. We get more stream of consciousness, more free indirect discourse, more ellipses and non sequiturs. Richardson uses modernist tools, but uses them to depict Mahony's madness, or the way he appears to his young son. Whenever we're back with Mahony's sane (and long suffering) wife, Mary, the narrator is strong. It's about the life of the restless Richard Mahony, from the Ballarat goldfields in the 1850s, via many adventures in Australia and abroad, to the latter part of the nineteenth century. It’s also a stunning portrait of a marriage, and an incredibly detailed account of colonial Australia: Ballarat, Melbourne, the bush and the seaside. Reading it was one of the most fulfilling literary experiences I’ve ever had. This is mainly due to the character of Richard Mahony and his self-induced tribulations It's about the life of the restless Richard Mahony, from the Ballarat goldfields in the 1850s, via many adventures in Australia and abroad, to the latter part of the nineteenth century. It’s also a stunning portrait of a marriage, and an incredibly detailed account of colonial Australia: Ballarat, Melbourne, the bush and the seaside. Reading it was one of the most fulfilling literary experiences I’ve ever had. This is mainly due to the character of Richard Mahony and his self-induced tribulations, and the intimate details of his marriage to Polly (later known as Mary). But it is also due to the historical aspects: Mahony provides complete immersion in the experience of the past, through the eyes of just a few characters. It’s also an incredibly compassionate novel. I only read afterwards that the character of Mahony was partly inspired by Richardson’s father, and that just broke my heart all over again. Mary slowly becomes perceptive to Richard’s foibles—particularly the ones that get them into trouble—and becomes stronger, and less materially motivated. At the beginning you can see how well they match: it centres around their kindnesses, they way they (attempt to) perceive the good in others (though Mary soon learns that sometimes Richard will maintain a grudge). Mary is more likely to see the ‘good’ and that is where she is kind, whereas Richard will crumble when faced with the ‘weak’. Richardson exquisitely renders a long-term relationship: the way they misinterpret each other and begin to keep secrets, the way they manage each other, sometimes fear each other. The novel is an incredible, humble, love story. Each revelation of character comes about through sections of the novel that are book length. That makes it sound dreary, but it’s not. There are seeds planted (sometimes in conversations with other characters), events foreshadowed. When you begin reading it, you think it is all about the goldfields, and the men (and it is). But then Polly/Mary and a new cast of characters come along. Way, way down the line there are windfalls and travel and children and tragedy. Each ‘event’ is, as mentioned, a book of its own, so I can only be vague here. The whole that these events add up to is so revealing. As an Australian, too. (Though I think this holds up against European novels set in the 19th Century, is in fact much more accessible than many of them.) I had, for example, never thought very much about the way the gold rush messed up the class system for those who clung to it, fresh from the old country, and what that meant, how confusing it could be for them. More generally there is so much to learn (and so much colour) in regards to colonial Australia and the foundation of Victoria. I want to talk about Richard (though I really cannot possibly capture him). He is self-absorbed, he is manic at times—bursting with excitement for an idea, mainly a change—and then he sinks into deep depressions. He is over-sensitive: ‘How strange Richard was… how difficult! First, to be able to forget all about how things stood with him, and then to be twice as upset as other people’. He is definitely fickle, an ‘unpractical old dreamer’ as Mary thinks of him at one stage. He is paranoid and nervous, more so as he gets older. He loves isolation, but becomes bored of that too and surprises Mary (and the reader) with bouts of socialising. He is a skilled doctor, he is curious (a great reader, at one point becoming obsessed with spiritualism: ‘He believed and would continue to believe it impossible wholly to account for life and its phenomena in terms of physiology, chemistry, physics’). He is not humourless but his sensitivity sometimes gets in the way. He is sometimes confused. He is embarrassing to his son, Cuffy. Cuffy is such a surprising and wonderful voice added to the novel in later parts. Cuffy allows the reader to see the relationship of his parents, the places they live, their life and his father from a different angle. The way Richardson writes him captures the wonder and confusion (and temper) of childhood. This gives you an idea of the contradictions within, and the changeability of Richard, and how he values having experienced different things (no matter how troublesome at the time). It also gives you an idea of the rhythm in the prose, and the humour in the novel, too. It is not a solemn affair, even tragic circumstances are often given fresh views (ie. by Cuffy, the son). This was a difficult one to rate. For most of the book (nearly 90% of it, according to my Kindle) I was ready to give up at any moment. I was going to give it a two-star rating. Not one star, because even in the depths of its interminably meandering middle, it had clear literary merit. But god, it was so BORING. In the chronicle of the lives of Richard and Mary Mahony, it felt as though the author left not a single day undescribed. And then, towards the end, it suddenly became not only interesti This was a difficult one to rate. For most of the book (nearly 90% of it, according to my Kindle) I was ready to give up at any moment. I was going to give it a two-star rating. Not one star, because even in the depths of its interminably meandering middle, it had clear literary merit. But god, it was so BORING. In the chronicle of the lives of Richard and Mary Mahony, it felt as though the author left not a single day undescribed. And then, towards the end, it suddenly became not only interesting but heart-rending. The last ten percent is beautiful and sad, an incredible feat of naturalistic writing. Is it worth slogging through seven hundred pages of tedium to get to this stunning finish? I haven't quite made up my mind yet. okay, lots of this book is nice people, little events, writing varies from fine to amazing, but like lots of writing of this period has passages of intense emotional insight into how people work. What makes me want to give it 5/5 is the incredible, central portrait of a marriage, in-depth and life-long, showing two completely believable natures and how they unite then drift apart, so that, when you're reading the part that alternates POV sections (done in 3rd person but pov), you believe this person is totally write, a living, breathing person, reasonable and feeling, and the other is a selfish monster, of each person, as you read it in turn: how can one person manage to write that, to inhabit both and make both fully real? As for the portrait, from the inside, of mental illness, i couldn't write that, and i've had it. How could someone, never mentally ill, imaginatively invent that, and get it right? To start with, a warning - this book is LONG. 942 pages of fairly small print. It's really three novels in one, so you need to be committed! The story is set in the latter half of the 19th century during the Australian gold rush and as the title describes, it tells of the rising and falling (and rising and falling...) fortunes of Richard Mahony, a man for whom the grass is always greener elsewhere. I found him incredibly frustrating and maddening, but also a strangely sympathetic character, trap To start with, a warning - this book is LONG. 942 pages of fairly small print. It's really three novels in one, so you need to be committed! The story is set in the latter half of the 19th century during the Australian gold rush and as the title describes, it tells of the rising and falling (and rising and falling...) fortunes of Richard Mahony, a man for whom the grass is always greener elsewhere. I found him incredibly frustrating and maddening, but also a strangely sympathetic character, trapped in the confines of his era. In parallel to his fortunes, it shows the changes in his relationship with his wife and beautifully illustrates the complexity and love-hate nature of marriage. Given this is a book written by a woman who had to use a man's name in order to get published, I find its gender representations fascinating. Women are described as being ideally suited to housework, with a number of similar comments throughout, and they are always - at least superficially - at the beck and call of their men. Yet several women, and Richard's wife in particular, are more sensible, cleverer, even more business-minded than their husbands. I like to think of 'Henry' (Ethel) having a chuckle as she inserted some subtle (and not so subtle) feminist perspectives into a book that became an Australian classic. Given its length, inevitably it is uneven and lags a bit in places, but - the third and final book, in particular, is unbelievably moving, displaying a piercing insight into married life and familial relationships. I wept at the end. One of the most enjoyable books I have ever read, and easily the best Australian book. I continue to be amazed that this is not more well known and recognised as one of the best examples of Australian fiction. I read it as a three volume set and couldn't put it down. This review has been hidden because it contains spoilers. To view it, click here. It takes a perverse type of courage to write a 900 page novel about such an obstinate and unlikeable man. The three books tell the repeating cycle of Richard Mahony's attempts to settle and find happiness in various towns in Australia and England. Each time he disastrously upheaves his family, plunging them into more financial peril, he ignores all the advice and experience of those around him in order to make the same mistakes yet again. The incredible frustration of this pattern is only tempere It takes a perverse type of courage to write a 900 page novel about such an obstinate and unlikeable man. The three books tell the repeating cycle of Richard Mahony's attempts to settle and find happiness in various towns in Australia and England. Each time he disastrously upheaves his family, plunging them into more financial peril, he ignores all the advice and experience of those around him in order to make the same mistakes yet again. The incredible frustration of this pattern is only tempered by the book's one shining light, the character of his wife Mary: a stoical and quietly heroic force, working in the background to reclaim what she can from the wreck of Mahony's misadventures. Ethel Florence Lindesay Richardson's use of a pen-name, adopted for mixed motives, probably militated against recognition especially when feminist literary history began. Maurice Guest was highly praised in Germany when it first appeared in translation in 1912, but received a bad press in England, though it influenced other novelists. The publishers bowdlerized the language for the second imprint. Ethel Florence Lindesay Richardson's use of a pen-name, adopted for mixed motives, probably militated against recognition especially when feminist literary history began. Maurice Guest was highly praised in Germany when it first appeared in translation in 1912, but received a bad press in England, though it influenced other novelists. The publishers bowdlerized the language for the second imprint. The trilogy suffered from the long intervals between its three volumes: Australia Felix (1917); The Way Home (1925) and Ultima Thule (1929). The last brought overnight fame and the three volumes were published as one in 1930. Her fame in England was short-lived; as late as 1977, when Virago Press republished The Getting of Wisdom, some London critics referred to the author as 'Mr Richardson'. Her short stories, The End of a Childhood (1934), and the novel, The Young Cosima (1939), had lukewarm receptions.